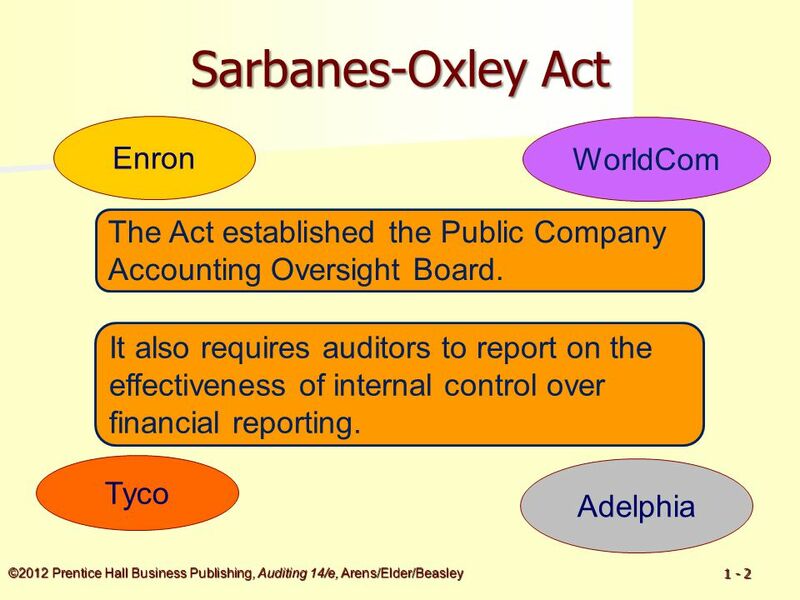 2 ©2012 Prentice Hall Business Publishing, Auditing 14/e, Arens/Elder/Beasley 1 - 2 Adelphia Enron Tyco WorldCom Sarbanes-Oxley Act The Act established the Public Company Accounting Oversight Board. 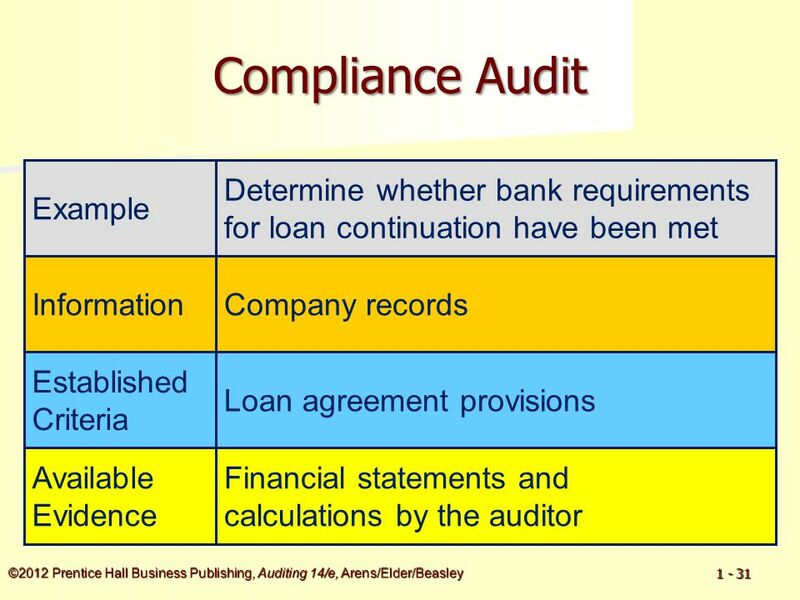 It also requires auditors to report on the effectiveness of internal control over financial reporting. 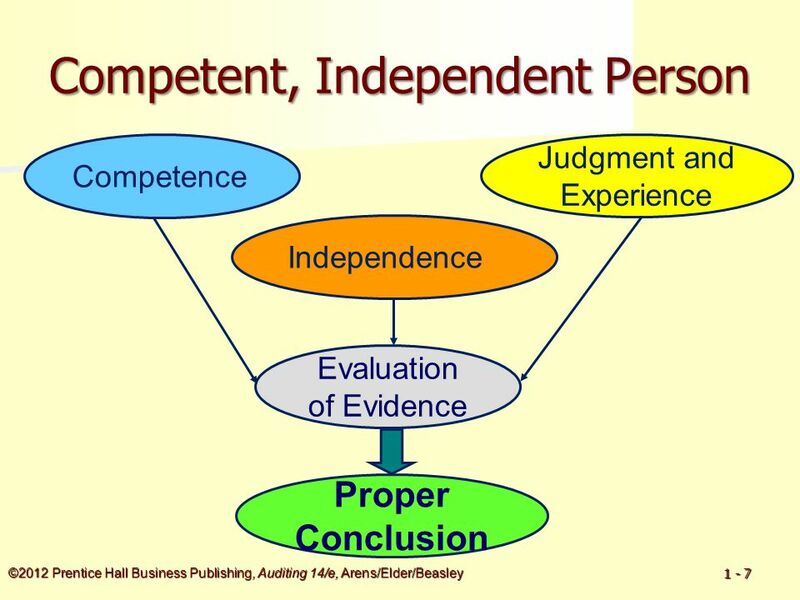 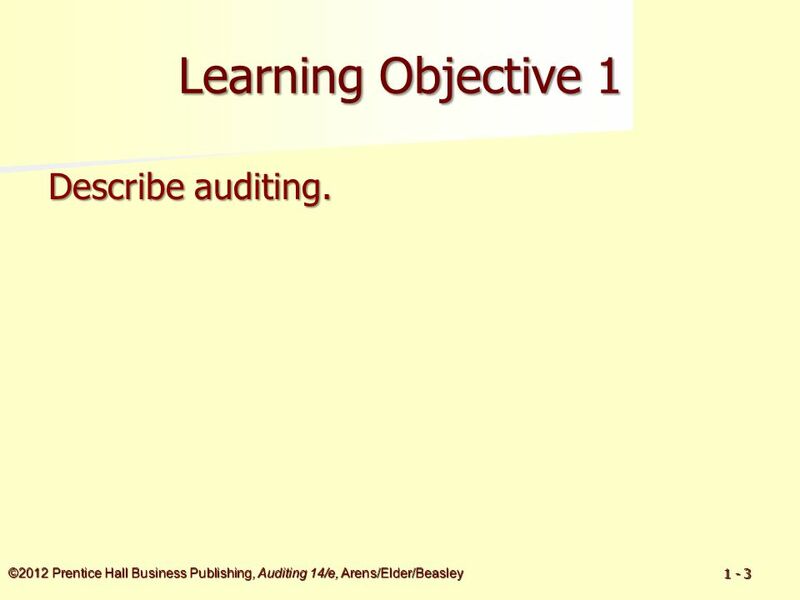 3 ©2012 Prentice Hall Business Publishing, Auditing 14/e, Arens/Elder/Beasley 1 - 3 Learning Objective 1 Describe auditing. 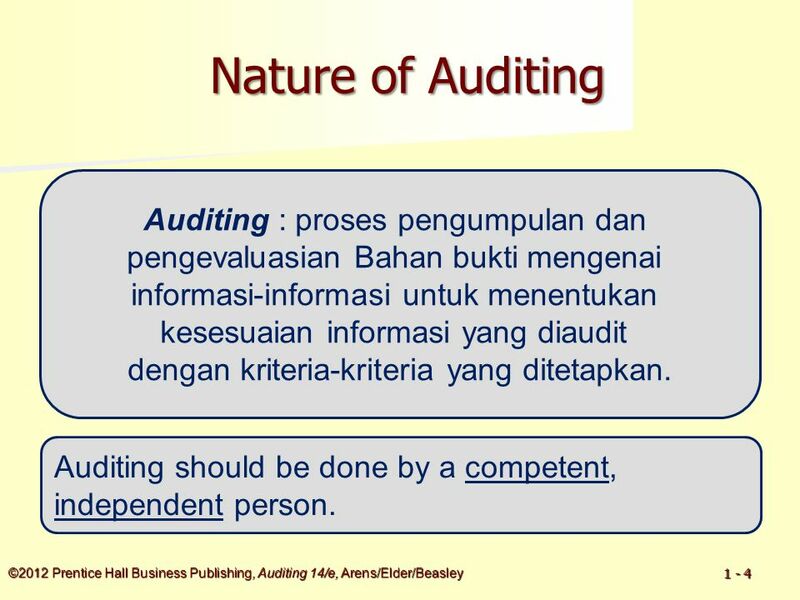 4 ©2012 Prentice Hall Business Publishing, Auditing 14/e, Arens/Elder/Beasley 1 - 4 Nature of Auditing Nature of Auditing Auditing : proses pengumpulan dan pengevaluasian Bahan bukti mengenai informasi-informasi untuk menentukan kesesuaian informasi yang diaudit dengan kriteria-kriteria yang ditetapkan. 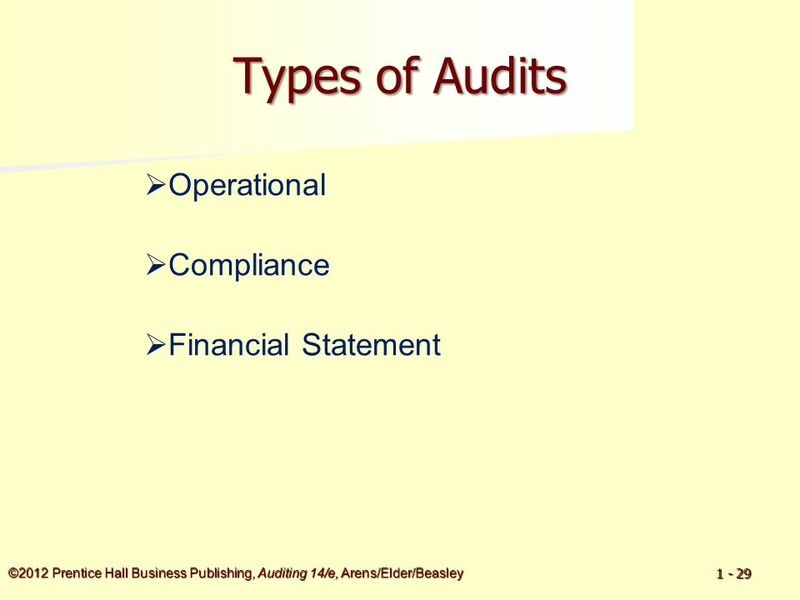 Auditing should be done by a competent, independent person. 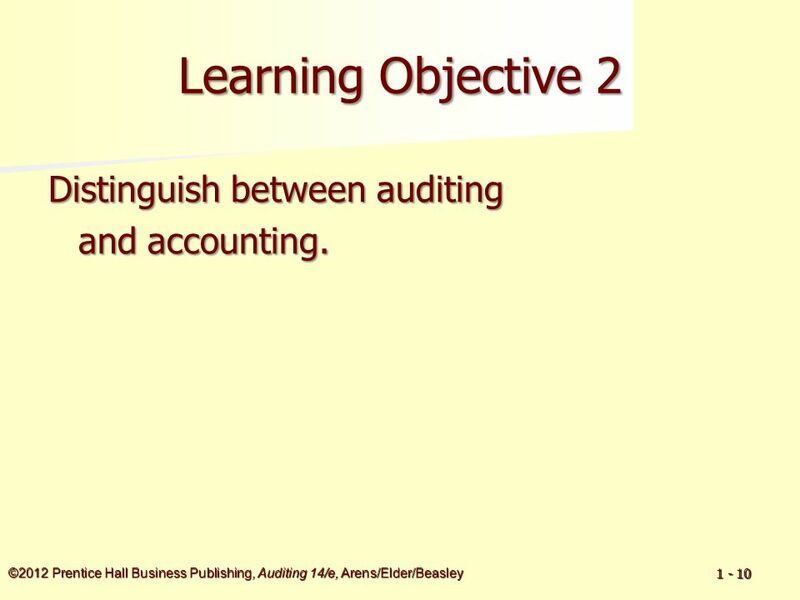 10 ©2012 Prentice Hall Business Publishing, Auditing 14/e, Arens/Elder/Beasley 1 - 10 Learning Objective 2 Distinguish between auditing and accounting. 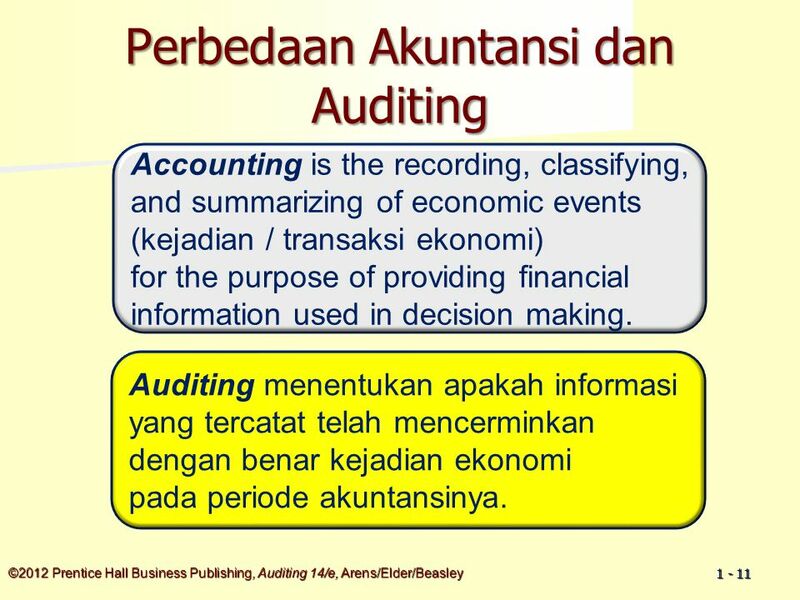 11 ©2012 Prentice Hall Business Publishing, Auditing 14/e, Arens/Elder/Beasley 1 - 11 Perbedaan Akuntansi dan Auditing Accounting is the recording, classifying, and summarizing of economic events (kejadian / transaksi ekonomi) for the purpose of providing financial information used in decision making. 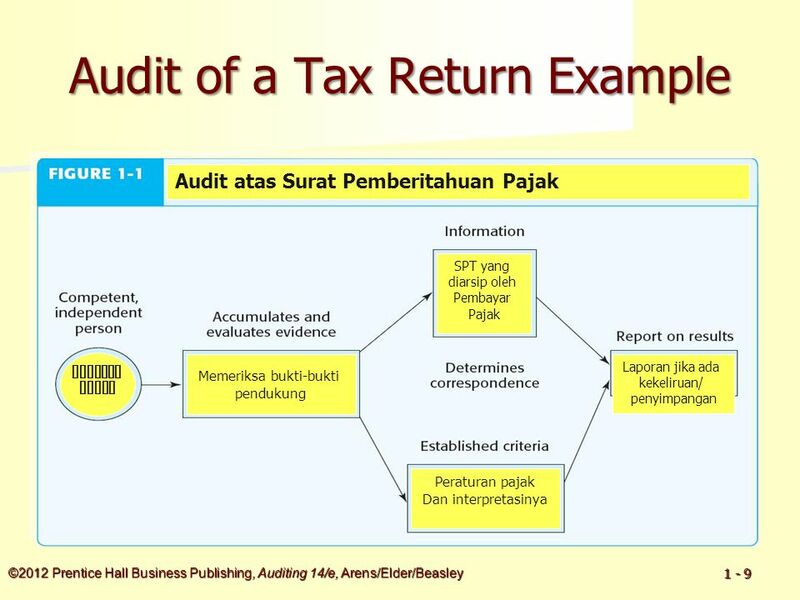 Auditing menentukan apakah informasi yang tercatat telah mencerminkan dengan benar kejadian ekonomi pada periode akuntansinya. 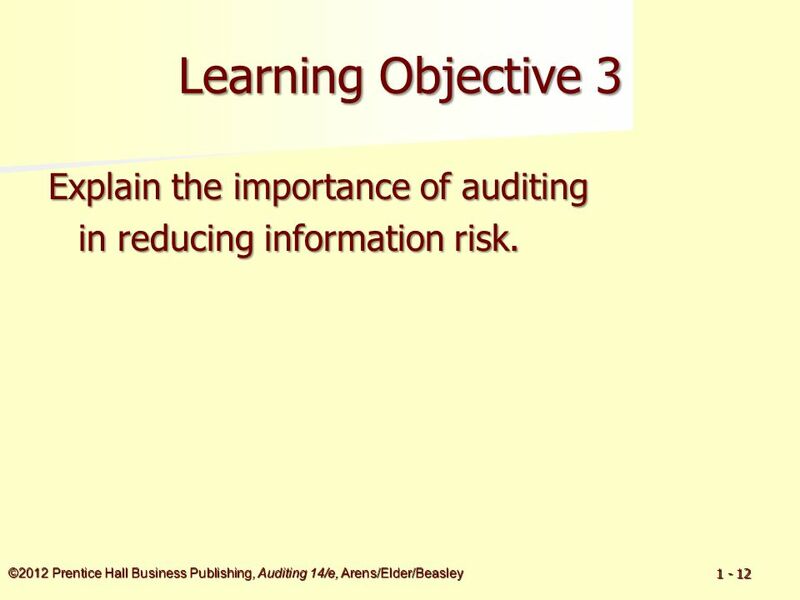 12 ©2012 Prentice Hall Business Publishing, Auditing 14/e, Arens/Elder/Beasley 1 - 12 Learning Objective 3 Explain the importance of auditing in reducing information risk. 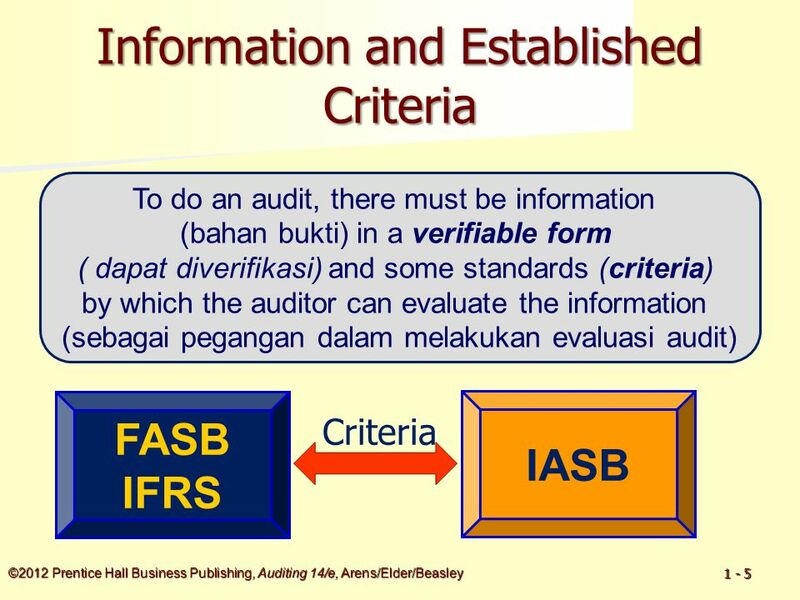 13 ©2012 Prentice Hall Business Publishing, Auditing 14/e, Arens/Elder/Beasley 1 - 13 Aspek ekonomi dari auditing Demand Driver Information risk Pengurangan risiko informasi merupakan alasan ekonomi utama yang melatarbelakangi kebutuhan auditing. 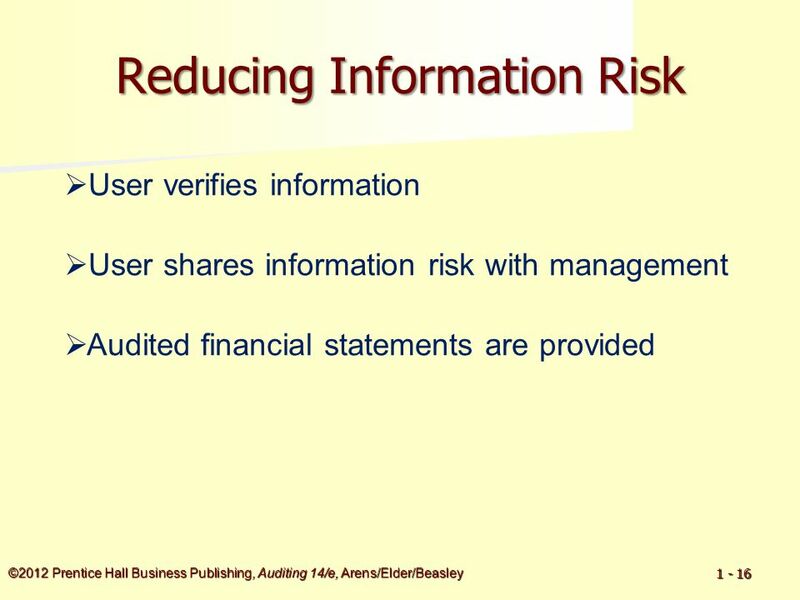 What is meant by “Information risk”? 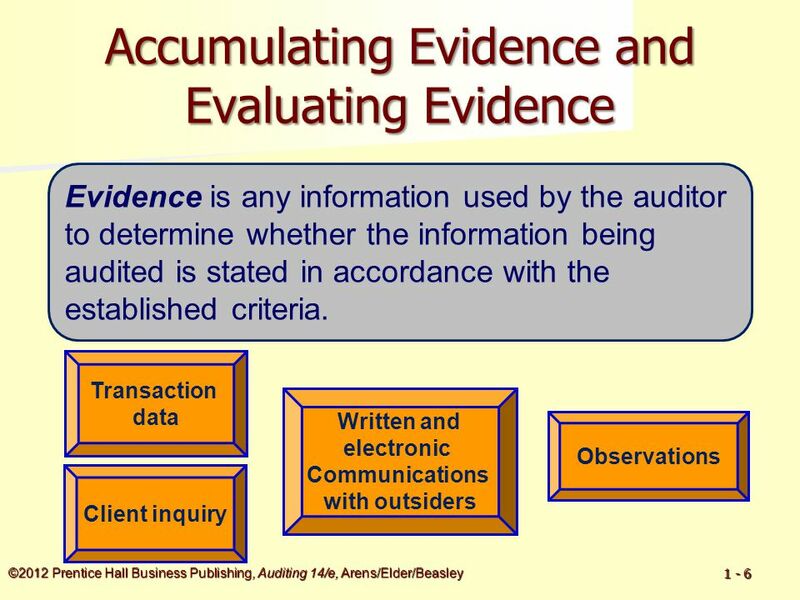 14 ©2012 Prentice Hall Business Publishing, Auditing 14/e, Arens/Elder/Beasley 1 - 14 Learning Objective 4 List the causes of information risk, and explain how this risk may be reduced. 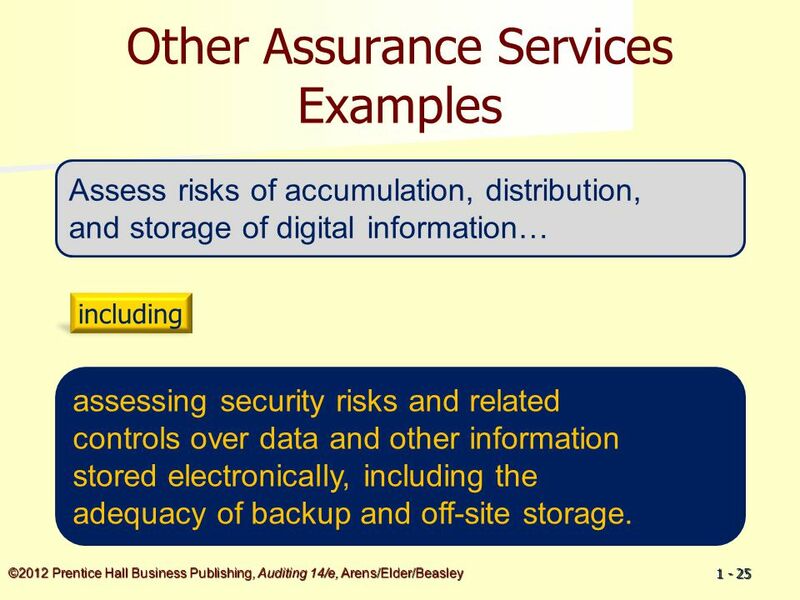 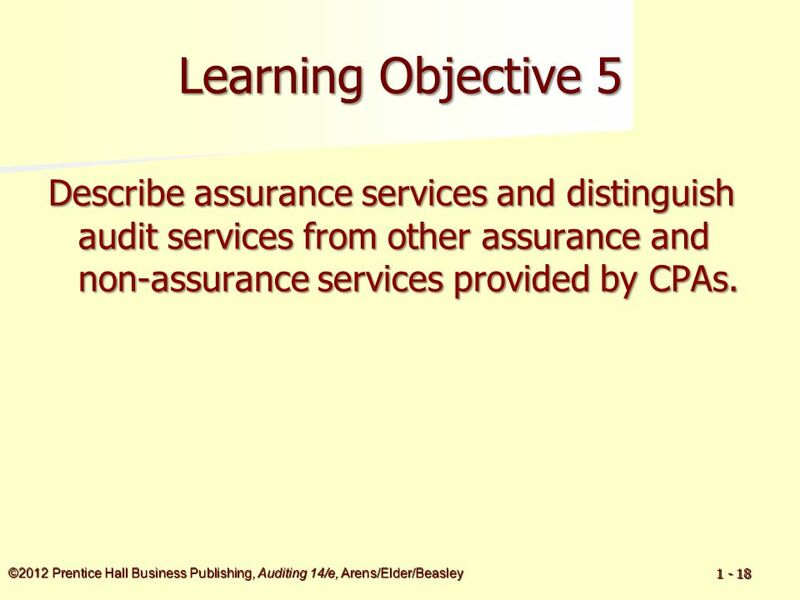 18 ©2012 Prentice Hall Business Publishing, Auditing 14/e, Arens/Elder/Beasley 1 - 18 Learning Objective 5 Describe assurance services and distinguish audit services from other assurance and non-assurance services provided by CPAs. 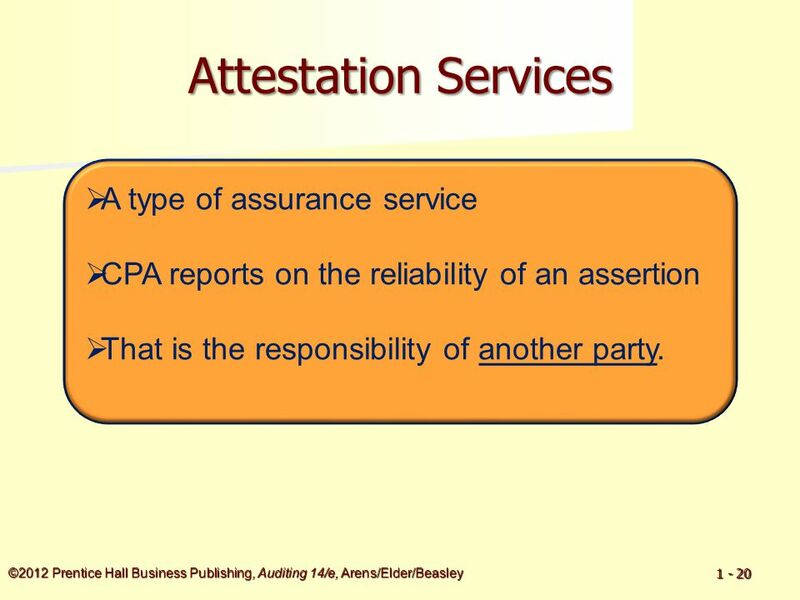 20 ©2012 Prentice Hall Business Publishing, Auditing 14/e, Arens/Elder/Beasley 1 - 20 Attestation Services  A type of assurance service  CPA reports on the reliability of an assertion  That is the responsibility of another party. 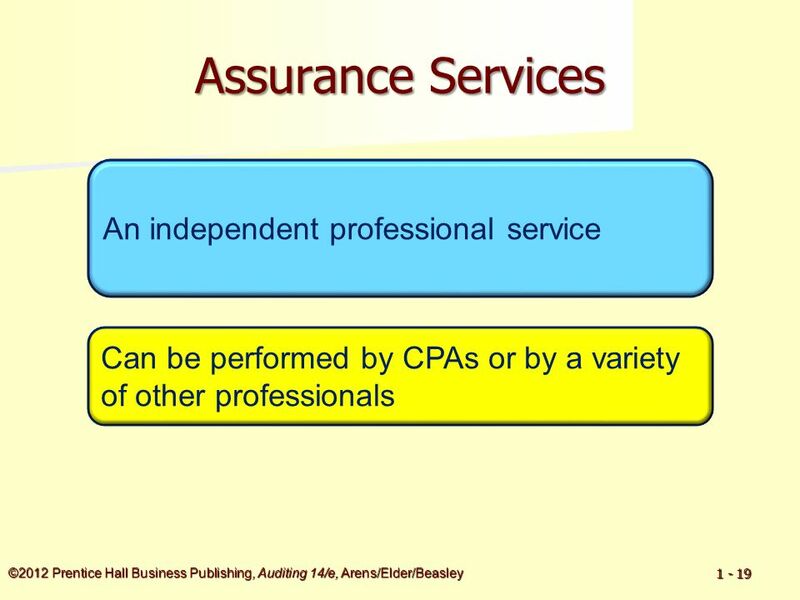 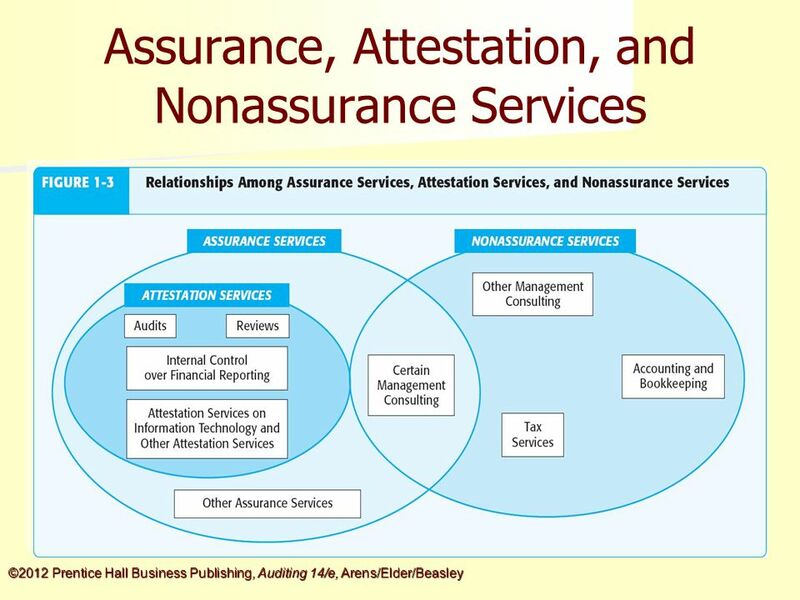 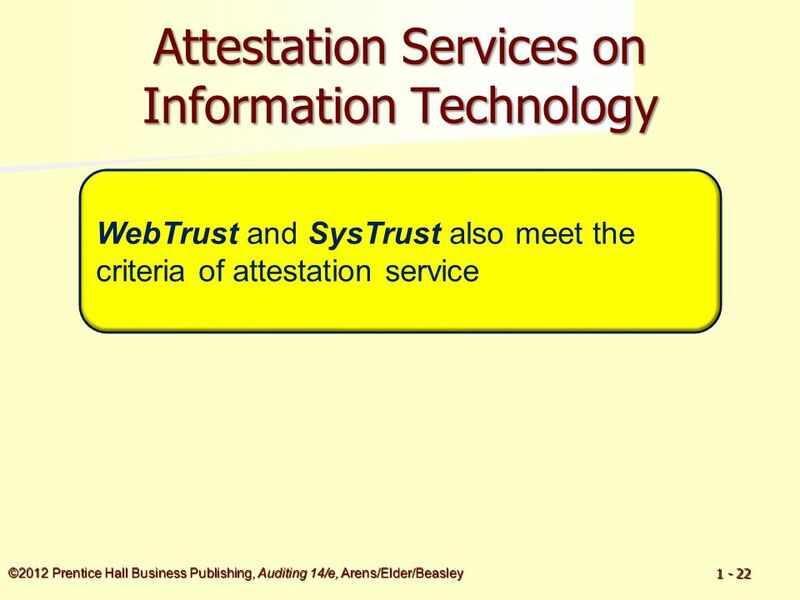 23 ©2012 Prentice Hall Business Publishing, Auditing 14/e, Arens/Elder/Beasley 1 - 23 Other Assurance Services Most of the other assurance services that CPAs provide do not meet the formal definition of attestation services. 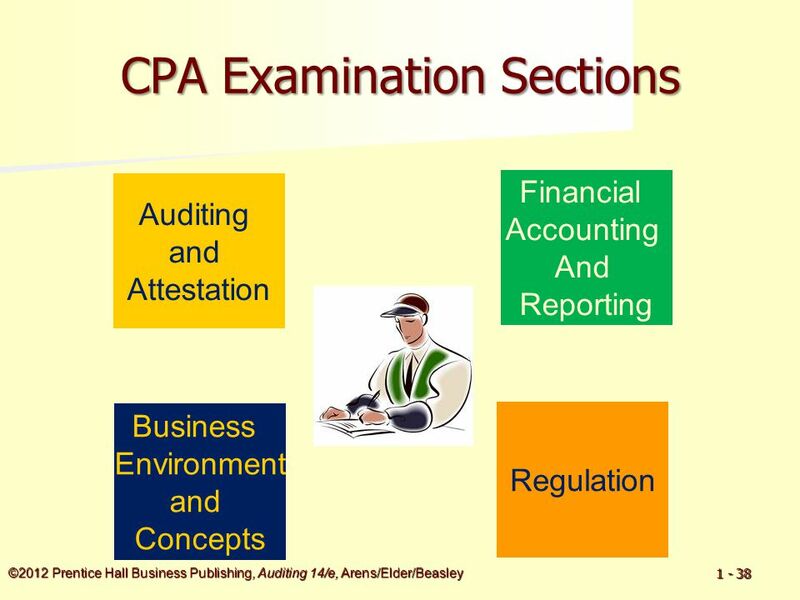 The CPA is not required to issue a written report. 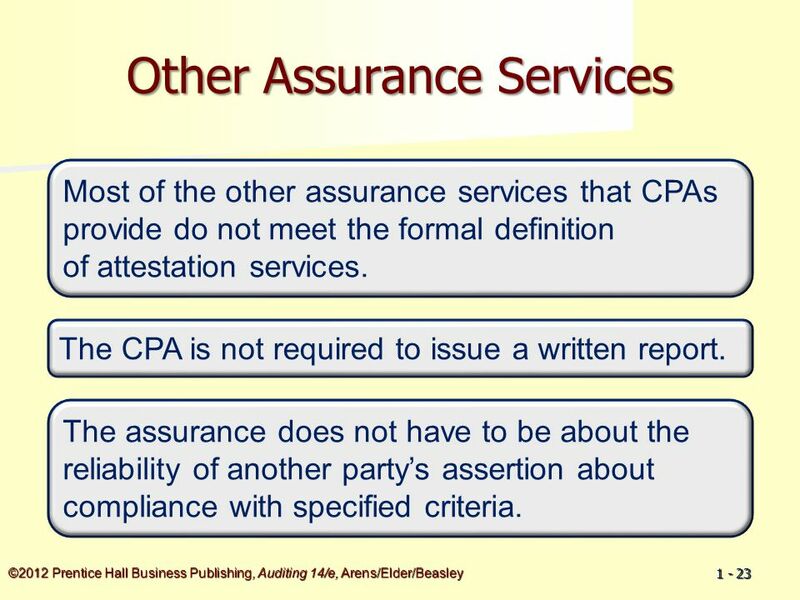 The assurance does not have to be about the reliability of another party’s assertion about compliance with specified criteria. 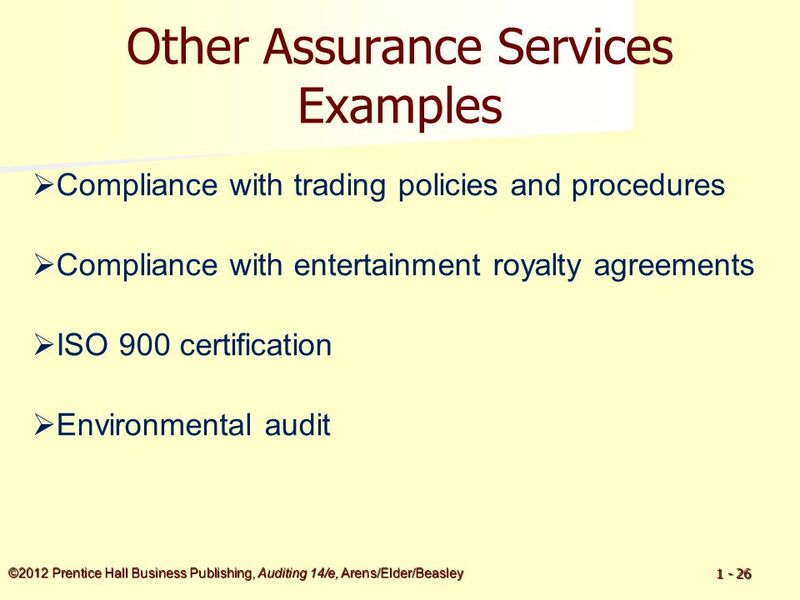 24 ©2012 Prentice Hall Business Publishing, Auditing 14/e, Arens/Elder/Beasley 1 - 24 Green Initiatives Bring Assurance Opportunities, Competition Global interest has triggered a surge in reports. 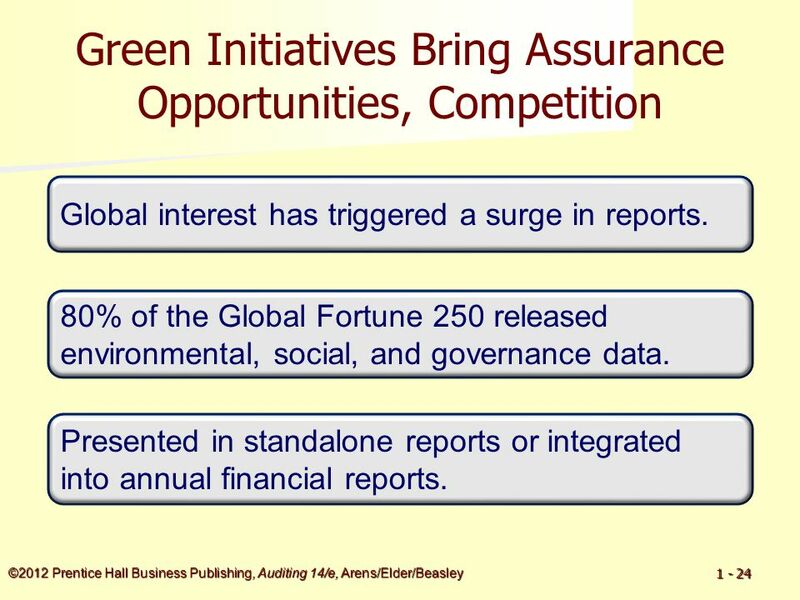 80% of the Global Fortune 250 released environmental, social, and governance data. 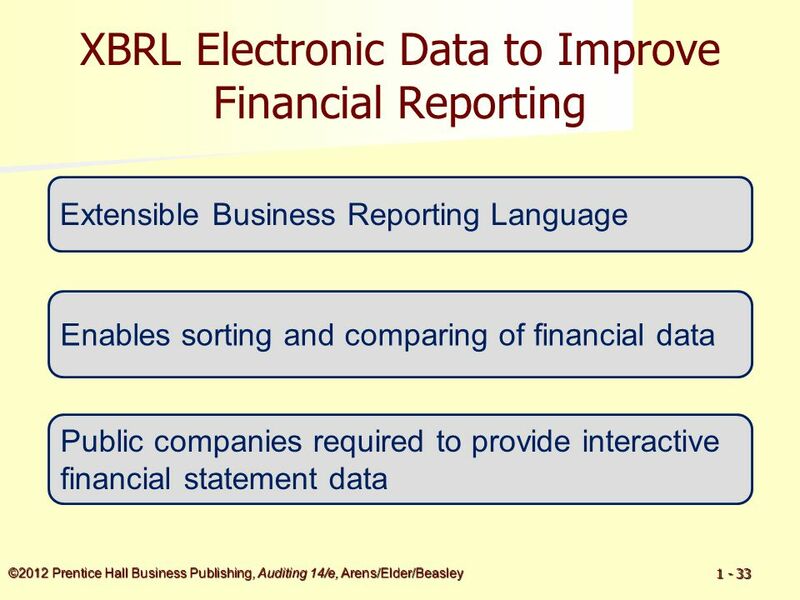 Presented in standalone reports or integrated into annual financial reports. 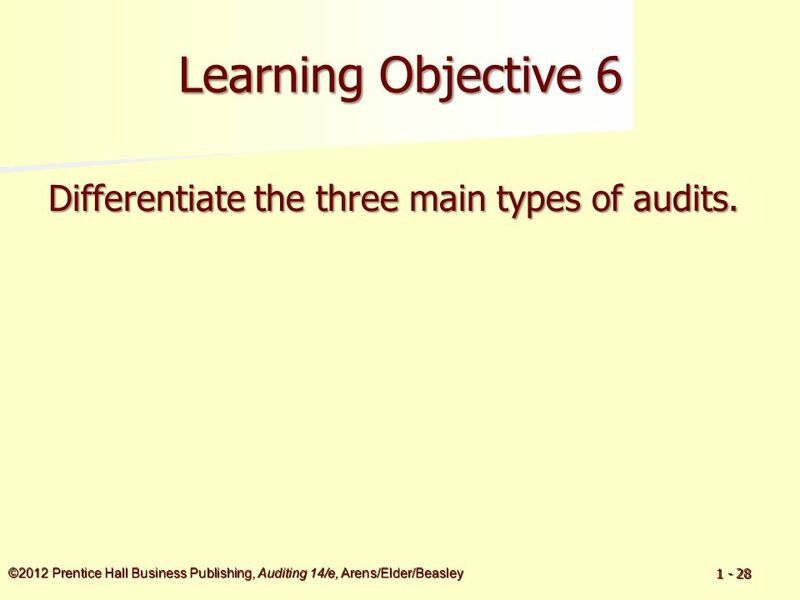 28 ©2012 Prentice Hall Business Publishing, Auditing 14/e, Arens/Elder/Beasley 1 - 28 Learning Objective 6 Differentiate the three main types of audits. 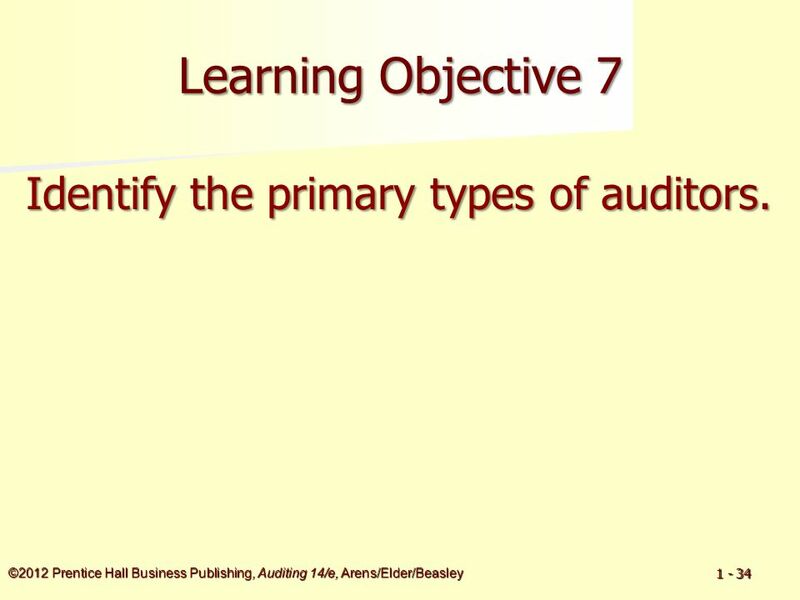 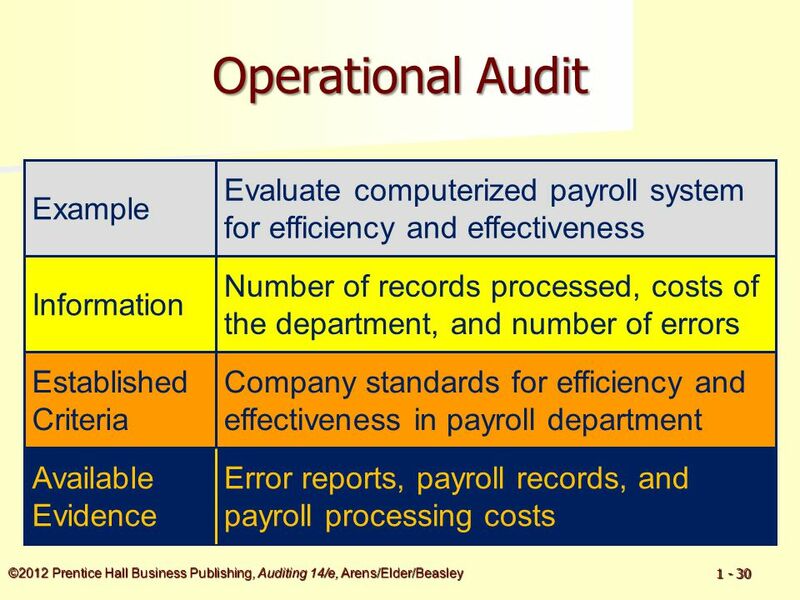 34 ©2012 Prentice Hall Business Publishing, Auditing 14/e, Arens/Elder/Beasley 1 - 34 Learning Objective 7 Identify the primary types of auditors. 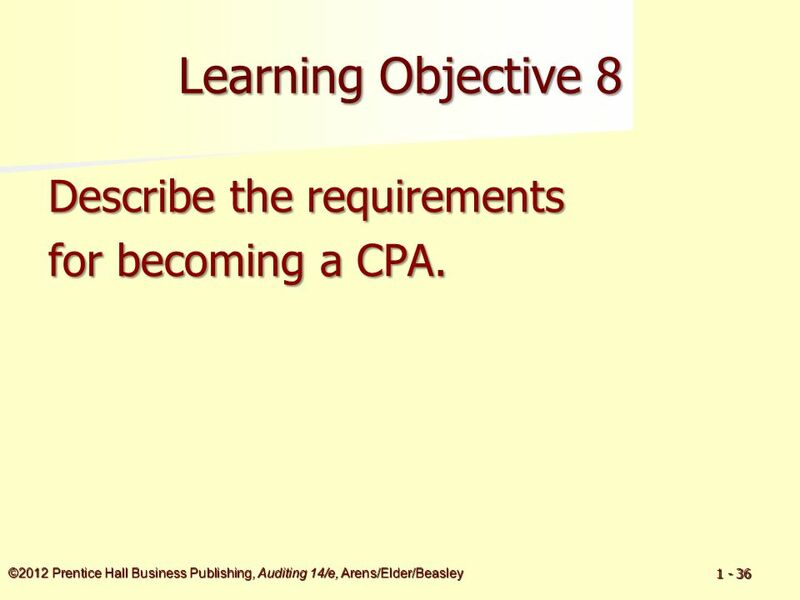 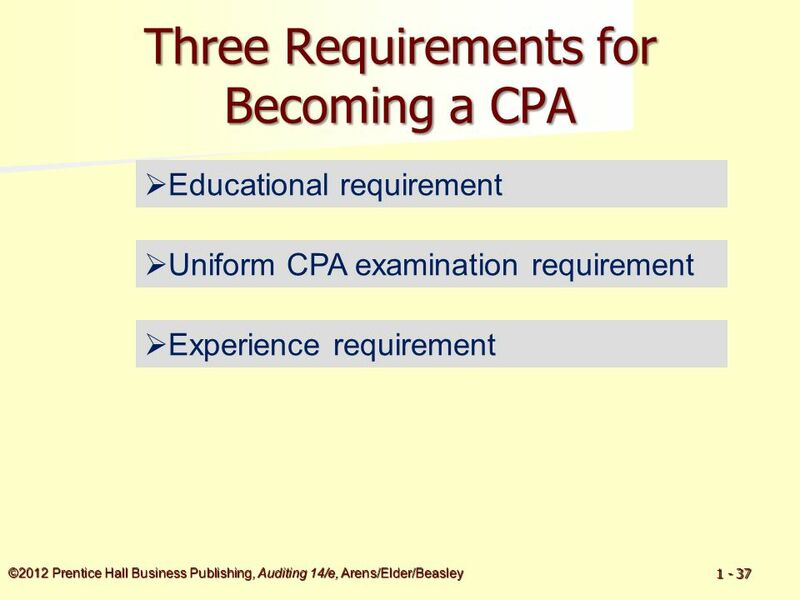 36 ©2012 Prentice Hall Business Publishing, Auditing 14/e, Arens/Elder/Beasley 1 - 36 Learning Objective 8 Describe the requirements for becoming a CPA. 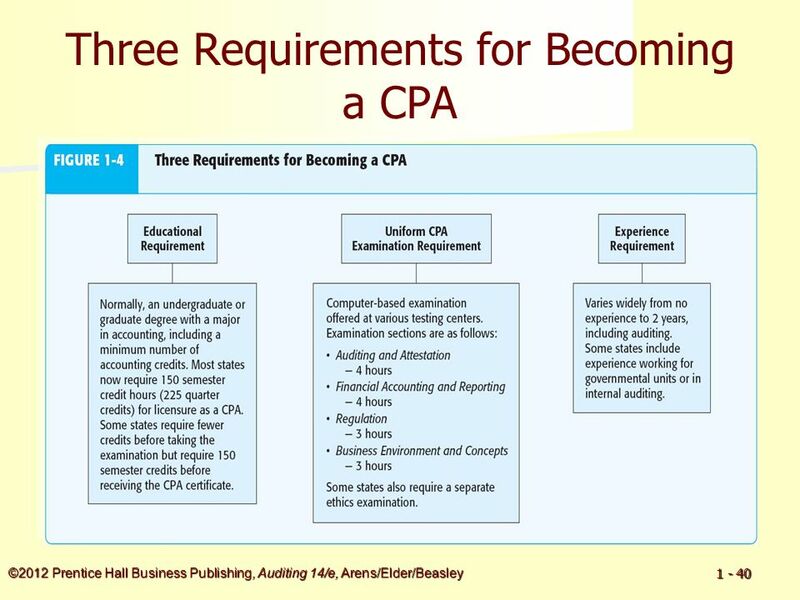 39 ©2012 Prentice Hall Business Publishing, Auditing 14/e, Arens/Elder/Beasley 1 - 39 CBT-e: The CPA Exam Gets a Makeover New content and skill specification outline revisions. 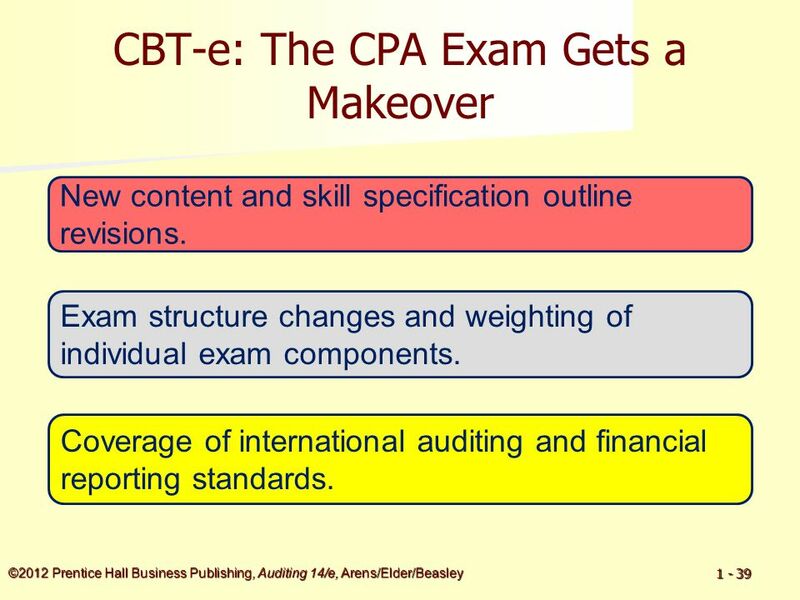 Exam structure changes and weighting of individual exam components. 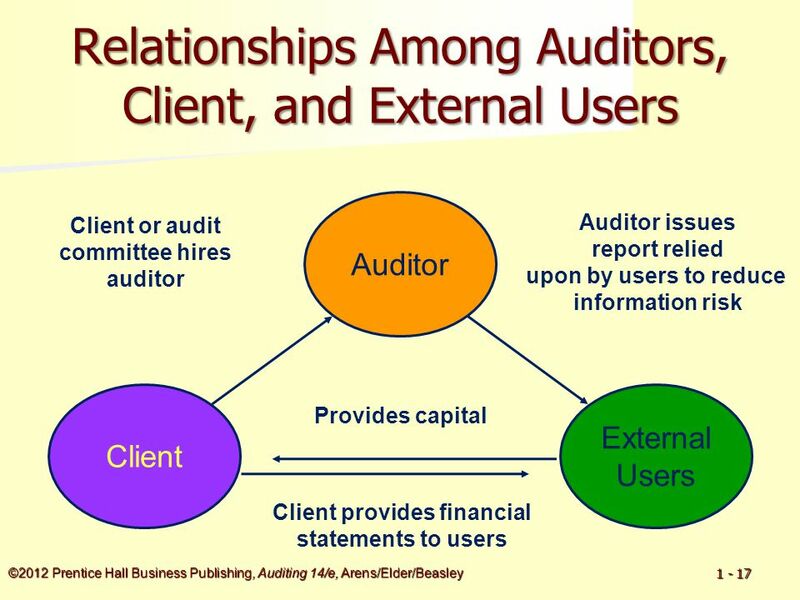 Coverage of international auditing and financial reporting standards. 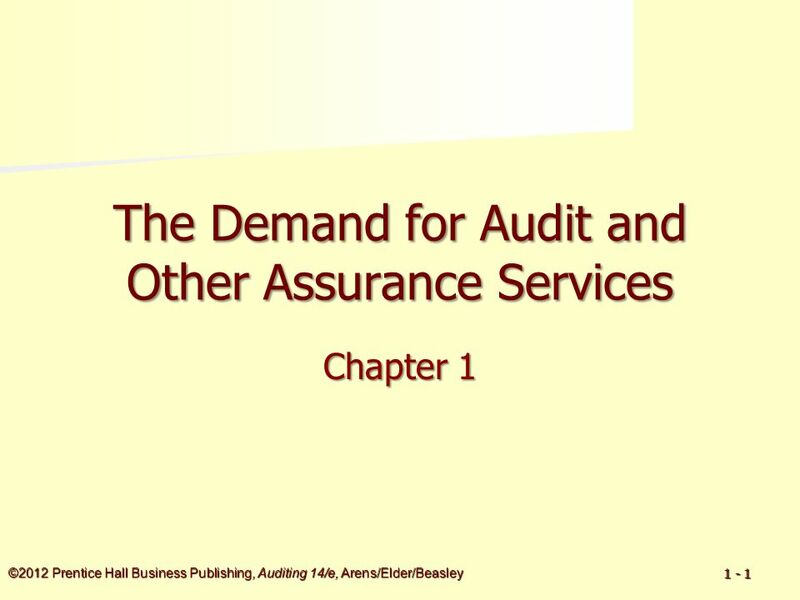 Download ppt "©2012 Prentice Hall Business Publishing, Auditing 14/e, Arens/Elder/Beasley 1 - 1 The Demand for Audit and Other Assurance Services Chapter 1." 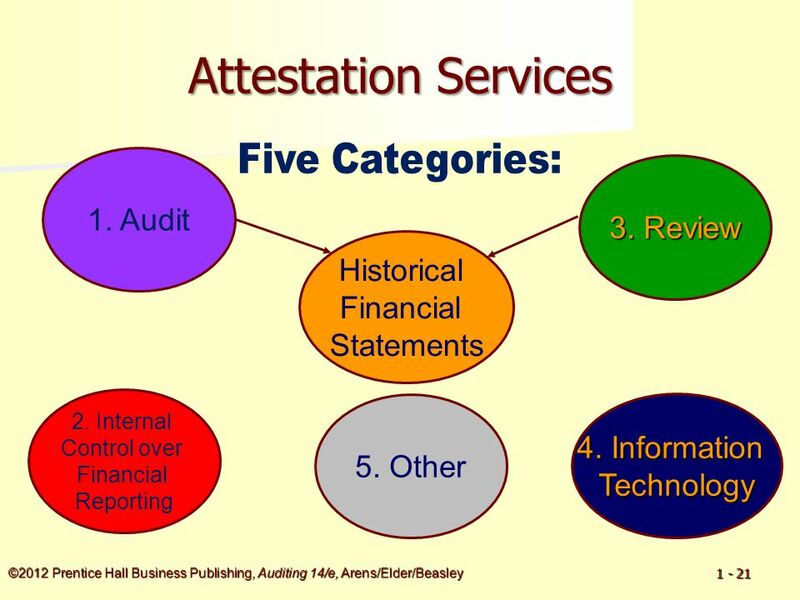 Special Reports and Accounting and Review Services. 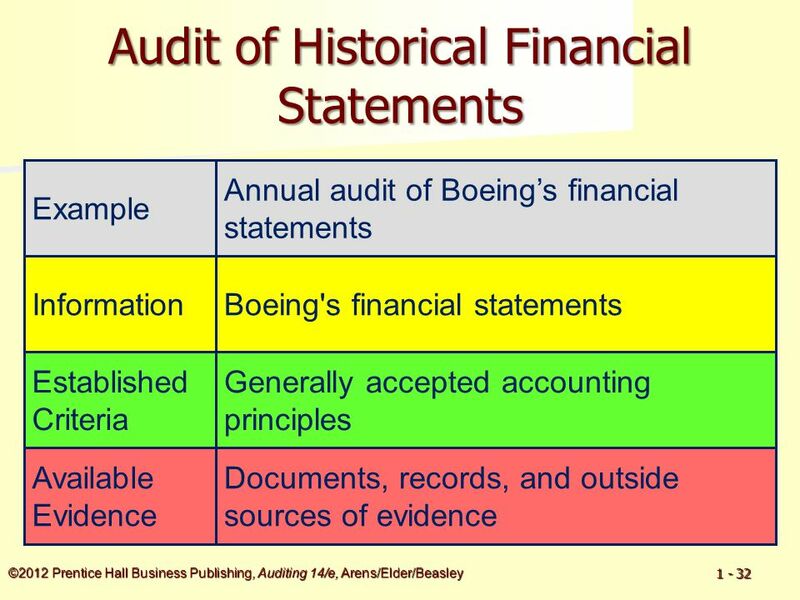 Foundations of Business Introduction to Financial Reporting The Income Statement. 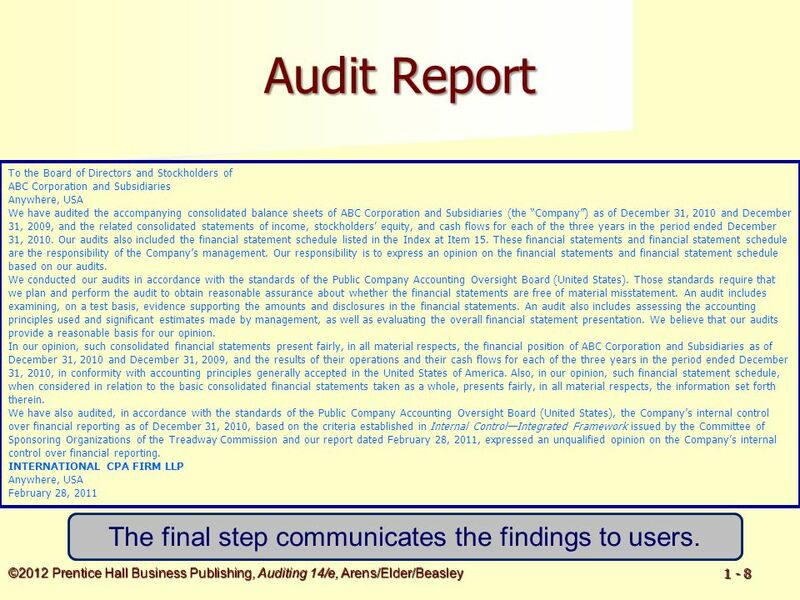 Module A1 Other Public Accounting Services ACCT 4080. 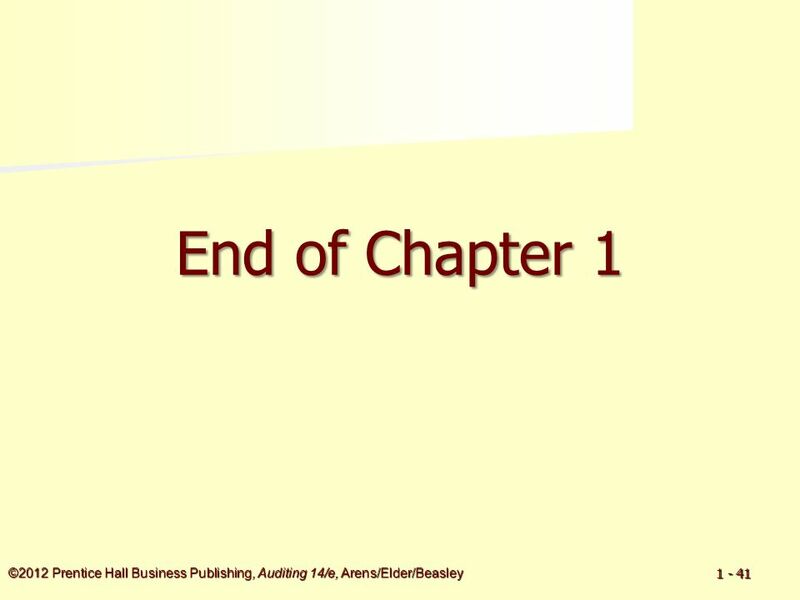 Intro & Chapter 2-1 Bob Anderson, UCSB CHAPTER 2-1 PROFESSIONAL STANDARDS: CHAPTER 2 WELCOME TO ECON 132- AUDIT. 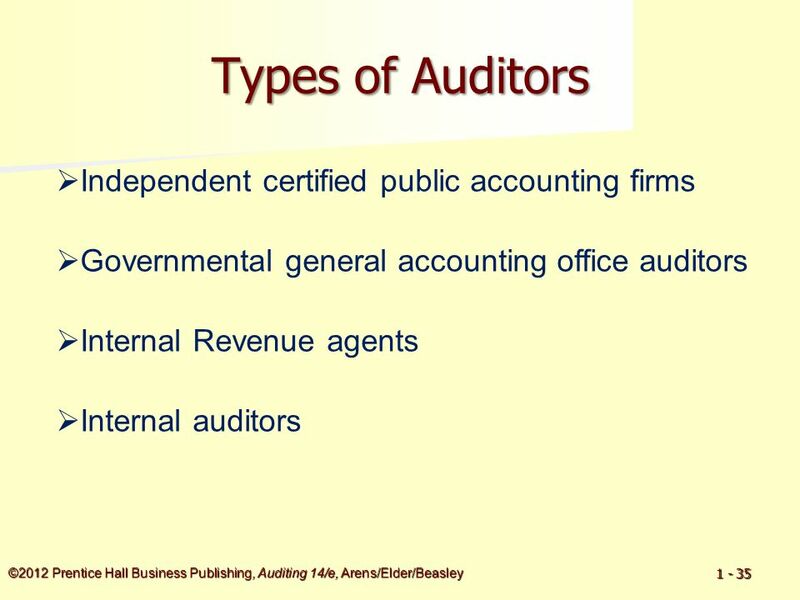 Auditing March 30, 2015 1 BUS 425 – Auditing Chapter 1 The Demand for Audit Services.